Moped and light-moped riders are at relatively high risk of being a crash casualty. Although there is a trend towards fewer deaths, in the Netherlands, the risk of being killed or seriously injured remains very large compared with other modes of transport. In the Netherlands, helmet use is mandatory for moped riders, but not for light-moped riders. In recent years we have seen a strong increase in the number of light mopeds (especially the scooter model is widely sold), whereas the number of mopeds has been decreasing slightly. Because the registration of crashes and the mobility data do not distinguish between mopeds and light mopeds, the individual risks of mopeds and light mopeds cannot be distinguished. Analyses of light-moped crashes indicate that behavioural factors the most common crash factors. Examples are: distraction or lack of attention, speed too high for the conditions, and too narrow focus or "I have priority" attitude. On the side of the crash opponent lack of attention/distraction and failure to give priority are mentioned as factors. The fact that (light) mopeds are equilibrium vehicles that do not protect the rider in a crash also contributes to the high crash risk of moped and light-moped riders. Various measures have been taken in the Netherlands to increase the safety of moped and light-moped riders (moped on the roadway, tuning up resistance, license plates, moped driving licence, riding test for moped riders). The effectiveness of two measures has been examined. Moving the moped from the cycle path to the roadway had a positive effect on the number of moped crashes. No positive effect on the crash risk of moped and light-moped riders could be determined for the introduction of the moped riding test. However, moped possession among youths, and with it the number of crashes, greatly diminished following the introduction of the measure. Microcars and speed pedelecs are legally part of the vehicle category 'mopeds’ but they are not discussed in this fact sheet. For information on these vehicle categories see SWOV Fact sheet Pedelecs and speed pedelecs. A scooter is a widely used term for a moped or light moped in the Netherlands. However, a scooter is no vehicle category but a vehicle model (legs next to each other instead of on either side of the vehicle). A scooter can be a moped, a light moped, or even a motorcycle. However, the term scooter often refers to a moped in the Netherlands. What is a moped or light moped? Mopeds and light mopeds are two-wheeled vehicles that are equipped with an internal combustion engine with a cylinder capacity not exceeding 50 cc or an electric motor with a maximum power not exceeding 4 kW). A moped has a maximum construction speed of 45 km/h and must have a yellow license plate . The light moped is legally placed in the category mopeds and has many of the same properties. However, the maximum legal construction speed of the light moped is only 25 km/h and this vehicle must have a blue license plate . Mopeds and light mopeds come in different models. On the scooter model the rider sits with the legs next to each other, on the bike model the rider’s legs are placed on either side of the vehicle. A scooter can be a moped, a light moped or even a motorcycle. However, in the Netherlands the term often refers to a light moped. Which rules apply for riding a moped or light moped? Riding a moped or light moped requires an AM licence. This licence can be obtained from the age of 16, after having passed a theoretical and practical exam. The possession of an A or B licence also qualifies the owner to ride a moped or light moped. In addition, there are specific rules that apply for the moped or light moped. The moped rider must wear an approved moped helmet. In urban areas, the moped must use the roadway (since 1999). The travelling speed used must be no faster than the local speed limit, with a maximum speed of 45 km/h. In places where a cycle/moped path (RVV-Board G12a) is present, the moped must use this facility with a maximum speed of 30 km/h. Although since 1999 it is possible for moped riders to use the roadway, municipalities differ in regard to whether, when and to what extent this rule has been implemented. In Rotterdam, for example, moped riders are required to use mainly the roadway only since 2015. In rural areas, the moped is required to use the cycle/moped path with a maximum speed of 40 km/h. If this facility is not present, the moped must use the roadway and a maximum speed of 45 km/h applies . The light moped must use the cycle path in both urban and rural areas, with a maximum speed of 25 km/h . Wearing a helmet is not mandatory for light-moped riders. What is the annual number of casualties among moped and light-moped riders in the Netherlands? In 2016, there were 44 road deaths among (light-)moped riders (incl. microcar drivers); this is 7% of the total number of road deaths (629) in the Netherlands in 2016. 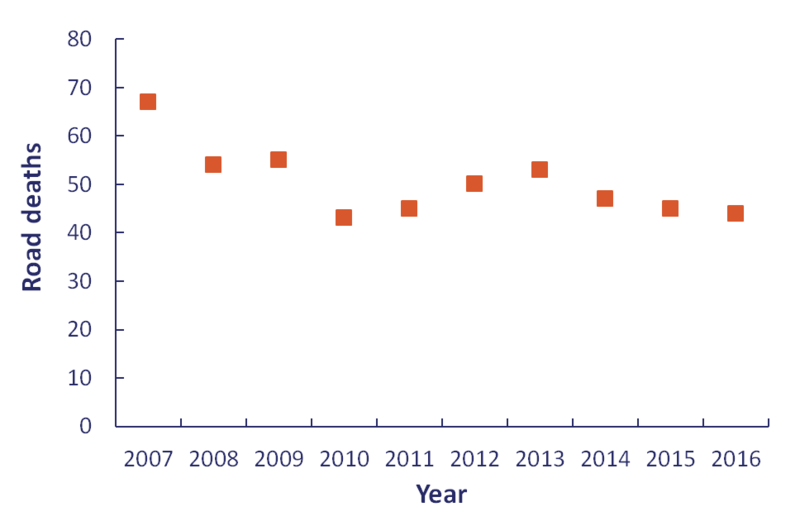 The number of road deaths among (light-)moped riders has decreased slightly over the past ten years. The number of serious road injuries among (light-)moped riders in 2016 is not known. Since 2009, when there were about 2,800, it has not been possible to reliably determine their number (see also SWOV Fact sheet Serious road injuries in the Netherlands). Figure 1. The real numbers of road fatalities among (light-)moped riders in the Netherlands (Source: CBS Statline). Which road users are casualties in crashes with a moped or light moped? Registered casualties in crashes with a moped or light moped are usually the riders themselves (see Table 1) [i]. Their proportion of the total number of registered road deaths is even as high as about 90%. During the period 2005-2009 the share of (light-)moped riders among serious road injuries (MAIS 2+) is somewhat lower (84%), but is still by far the largest group of casualties. Table 1. Registered numbers of road deaths and serious road injuries (MAIS 2 +) in the periods 2005-2009 and 2010-2015 [ii] in crashes in which a (light-)moped rider was involved. Sources: IenM; SWOV (based on LMR – DHD and BRON - IenM). Male (light-)moped riders in particular are found to be involved in fatal crashes (see Figure 2). Furthermore the high crash involvement in the young age groups is remarkable, especially among the under-18s the crash involvement is very high. 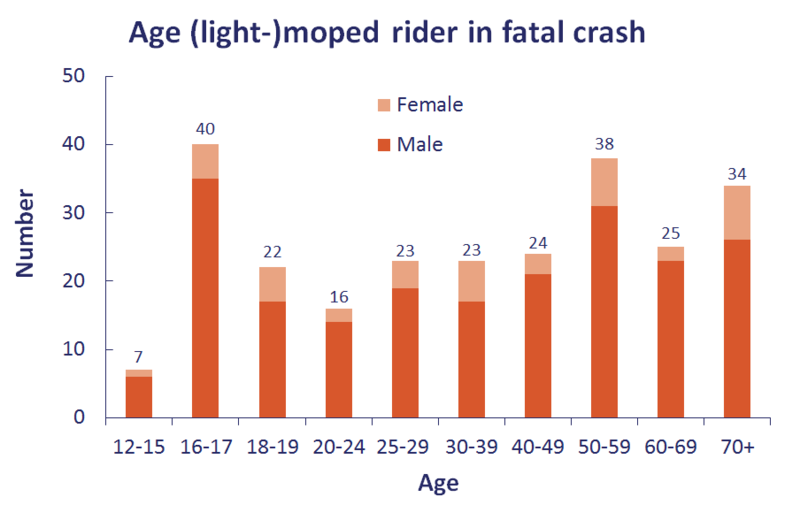 Among the older (light-)moped riders (the over-50s) and the crash involvement is also higher. Note that this is insufficient indication of the risk of young or male (light-)moped riders, because it is not clear how much these groups use (light-)mopeds. See also the question How much are (light-)mopeds used in the Netherlands? Figure 2. Age and gender of (light-)moped riders involved in fatal crashes[iii] in the period 2010-2015 (Source: IenM). [i] Note: these are the registered numbers – due to underreporting these are lower than the real numbers of casualties. The registration rate of road deaths among (light-)moped riders themselves is approximately 90% . The registration rate of serious road injuries among (light‑) moped riders in the period 2005-2009 is about 50%-60%. The registration rate of crashes in which a (light-)moped rider was involved is not known. [ii] The number of serious road injuries in the period 2010-2015 is unknown, because since 2009 the number of casualties by mode of transport cannot reliably be determined. [iii] 11 of these crashes are crashes between 2 (light-)moped riders. These crashes are therefore included twice, of course each with the age of the individual rider. How much are (light-)mopeds used in the Netherlands? The distance travelled on mopeds and light mopeds is quite stable at about 1 billion km per year [iv] Based on these figures, it is not possible to make a reliable distribution of the number of kilometres travelled on a moped or on a light moped, nor a reliable distribution of distances travelled by age or gender. It is however possible to distinguish between the possession of a moped, light moped and microcar. Table 2 shows that in recent years the number of light mopeds increased, whereas the number of mopeds decreased. Since 2012 there have been more light mopeds than mopeds in the Netherlands. Table 2. Vehicle fleet data of mopeds and light mopeds, measured on 1 January of each year (Source:CBS-Statline). Table 3 shows that not only young people own a (light) moped. 46% of the light moped owners and 42% of the moped owners are even 50 years of age or older. It must be noted that owning a vehicle is not the same as using a vehicle. It may well be the case that due to cheaper insurance the parents of the main user register the moped or light moped on their name. Table 3 Age of moped and light-moped owners in 2017 (Source: CBS-Statline). What are the risks for (light-)moped riders in Dutch traffic? The risk for (light-)moped riders to sustain fatal or serious injury is very large compared to other modes of transport, in the Netherlands. Per billion kilometres travelled about 65 (light-)moped riders died in traffic in the Netherlands (period 2010-2014) and almost 3,000 were seriously injured (period 2005-2009;[v] see Figure 3). This means that the fatality rate is similar to that of motorcyclists and many times higher than that of other modes of transport. Between 2010 and 2014, the risk of a fatal crash was 30 times higher for (light-)moped riders than for drivers. The risk of being seriously injured is many times higher for (light-)moped riders than for any other mode of transport. Figure 3. The fatality rate and (serious) injury rate(casualties per distance travelled) in the Netherlands for various modes of transport, averaged over 5 year periods. Sources: CBS and SWOV: calculated numbers of serious road injuries based on BRON and LMR. It is impossible to distinguish between the risks of moped riders and the risks of light-moped riders; the reason being that no (sufficiently) reliable distribution is made in either mobility data or in the crash registration. [v] The injury rate is available only until 2009; in later years the distribution of serious road injuries by mode of transport is not reliable. Which risk groups can be distinguished among (light-)moped riders? Within the group of (light-)moped riders who die in a road crash it is increasingly less easy to distinguish a risk group. Where before 2010 a relatively large proportion of casualties were younger than 20, the casualties are now spread over all ages (Figure 4). Until 2009, a very large proportion of the (light-)moped riders who were seriously injured in traffic were younger than 20. The present distribution is unknown. Figure 4. Development in the distribution of ages among (light-)moped riders [vi]. Source: LMR – DHD and BRON - IenM. [vi] From 2009, the underreporting of serious injury crashes has become too serious for reliable observations (see also SWOV Fact sheet Serious road injuries in the Netherlands). What are the causes of crashes involving (light-)mopeds? Below, the most frequent crash factors are discussed, classified under behaviour, vehicle, road. These crash factors originate from a Dutch in-depth study of light-moped crashes  and a Danish analysis of police files  of light-moped crashes with 16 and 17 year-old riders. position on the cycle path (8-14%). The factors that most frequently played a role in the development of the studied crashes from the perspective of the other road user (the crash opponent) are the limited view on other traffic (30-37%), the layout of the intersection (26-37%), the position of his vehicle (30-33%) and the behaviour of the light-moped rider that forces him to act (22%). The Danish analysis also mentioned attention (including distraction, 'failed to look' and 'narrow focus') as common behavioural factors . Three vehicle factors play an important role in the safety of (light-)mopeds. First, (light-)mopeds as vehicle offer no protection in the event of a crash; that is why the (light-)moped rider as well as the cyclist and motorcyclist is a vulnerable road user. Second, (light-)mopeds are equilibrium vehicles, which makes the vehicle control more demanding; the better the vehicle control, the better the attention that is available to anticipate and ride safely . Third, it is relatively easy to tune up (light-)mopeds. This is partly because many (light-)mopeds are constructed with a potentially high engine power after which a speed restriction is added for the sale to countries such as the Netherlands where a low speed limit applies . The Dutch in-depth study of (light-)moped crashes also indicates that, in addition to a 'bad state of the tires or brakes of the (light-)moped' (8-14%), a 'tuned up vehicle' (6-17%) is also a common vehicle factor. The most common infrastructure- or environment-related factors in the Dutch in-depth study were: 1) view on other traffic is limited by trees, parked cars or other objects (19-25%); 2) wet/damp road surface (14-19%); and 3) sub-optimal intersection layout, such as a non-conflict-free setting of the traffic lights or too small a positioning space before the bike path for vehicles turning off (14-17%) . In the Danish analysis of police files similar-related crash factors were found; however, they played less often a role . This may be due to the dependence of police data and the extent to which the police pay attention to the role of the infrastructure in the occurrence of crashes. [vi] The first (and lowest) number in parentheses indicates in how many percent of the crashes the crash factor has (almost) certainly played a role. The second percentage also includes the crashes in which there was some doubt on the validity of that factor. How dangerous is the combination of light mopeds, pedelecs and bicycles on a cycle path? Theoretically, it is to be expected that a cycle path will be less safe with larger numbers of users and with greater speed and mass differences between cycle path users (regular bikes, racing bikes, cargo bikes, pedelecs, light mopeds, light moped scooters). Observations during the morning rush hour on eight locations in the Hague and Amsterdam, however, found no direct link between the number of road users and their behaviour on the cycle path and the objective safety . The diversity was found to be limited: more than 90% of the cycle path users had a regular bike. Light-moped riders are responsible for about 6% of the total group of cycle path users and thus contribute to the many users. Light mopeds (especially in scooter model) are also wider and light-moped riders overtook more frequently due to the speed difference. However, per neighbourhood or per region the conditions can be different. Amsterdam, for example, has relatively narrow bike paths and a relatively high proportion of light mopeds and light mopeds scooters on its cycle paths. Based on a number of assumptions it has been estimated that it will be safer in Amsterdam traffic if light-moped riders – wearing a helmet– are moved to the roadway . For the most part this safety gain will result from the expected mobility shift: as a result of the mandatory helmet use a large number of people will move to a safer mode of transport (public transport or car). Davidse et al. comment that the speed differences between cars and light mopeds on 50km/h roads will be considerable as the legal maximum speed for light mopeds is 25 km/h. Due to the large differences in speed these researchers are of the opinion that light mopeds can only be moved to roadways with a 30 km/h maximum speed. How fast do light mopeds travel?
. A 2010 study in The Hague, Woerden and Apeldoorn  showed that light mopeds travelled at an average speed of 34 km/h; about 20% even travelled faster than 40 km/h. Measurements in 2012, 2013 and 2014 in Amsterdam showed that light-moped riders travel at an average speed of 31 km/h and that about 74% of light-moped riders exceed the maximum speed of 25 km/h . What is the effect of the moped helmet? No recent research into the effects of a moped helmet is known. However, a survey of 61 international studies indicates that by wearing a motorcycle helmet the risk of a fatal outcome of a motorcycle crash decreases with approximately 42%, and the risk of severe head injury with about 69% . Under Dutch law a moped helmet must meet the same requirements as a motorcycle helmet (these approval requirements are laid down in European regulations ECE R22-05). Therefore, the protective effect of a moped helmet is equal to that of a motorcycle helmet. However, because a motorcycle travels at a much faster speed, the difference between a crash with a protected and an unprotected head is much larger. It is therefore not certain if wearing a helmet on a moped prevents as much injury as wearing a helmet on a motorcycle. What has been the effect of the ‘Moped on the roadway’ measure? A year after the introduction of the ‘Moped on the roadway' measure in 1999 the number of crashes in urban areas involving mopeds had declined by 31%. About half of these (15%) could be attributed to the measure ; the other half (16%) to a decline in the total number of casualties among (light-)moped riders. In addition to a reduction in the number of crashes between moped riders and cyclists/pedestrians, the measure was also found to result in fewer crashes between mopeds and cars at intersections. Before 1999, many crashes occurred at intersections because moped riders travelled at a higher speed than expected on the cycle path and were noticed too late or not at all. To adjust the moped riders speed to the speeds travelled on the roadway, the permitted maximum speed of mopeds in urban areas was in 2008 increased from 30 to 45 km/h (on the roadway). This benefits both homogeneity (speed) and predictability. What has been the effect of measures to counter tuning up vehicles? The measures against tuning up (light) mopeds are twofold: actions from the trade associations and enforcement by the police. In 2004, the Self-regulation Agreement Mopeds including Advertising Code was signed by RAI and BOVAG . This way the sector made clear that they will no longer tune up (light) mopeds, that they will actively inform the customers about the legislation regarding tuning up, and they will not advertise tuning up sets. In addition it was agreed that (light) moped riders in commercials will always be shown safely in traffic (for example wearing a helmet). Various checks by the RAI Association in 2008 have resulted in some companies that violated the agreement being struck off as a member of the RAI Association or BOVAG . No independent evaluation of the effects of this agreement has been made . In the years ahead, RAI and BOVAG will conduct more active policy to counter tuning up mopeds . In 2016, the section Scooters of the RAI Association urgently summoned its members by letter to explicitly discourage tuning up (light) mopeds and in no way to cooperate. BOVAG tightened the membership terms since 1-1-2016 with regard to cooperating in tuning up (light) mopeds. The coming years the BOVAG directors will make (membership fee) funds available to increase checks on tuning up (light) mopeds to be carried out by a mystery shopper appointed by BOVAG. Every year this mystery shopper will carry out inspections on the basis of signals from importers, consumers and other stakeholders. When hard evidence is found that member will dismissed from BOVAG membership. In addition BOVAG extends the "Tune it down" campaign. BOVAG will consult ANWB about setting up a joint action or a call on consumers to bring back the light moped to its original condition . There is no information on the implementation or effectiveness of these plans. In the past there have been various efforts to improve enforcement of tuning up (light) mopeds. For example, in 2011 and 2012, the measuring ranges for measuring equipment were evaluated and tightened. And since 2015, it is possible to use speed measuring devices such as radar and laser gun to determine whether a light moped is speeding (formerly this could only be done with a dynamometer test). This makes enforcement more effective. Compared with a check via the dynamometer, a check on the riding speed instead of the construction speed has the advantage that it is less labour intensive, can be done at more locations, and can change locations more rapidly hence making it less easy to dodge control. However, no information is available on the impact of these enforcement measures. The Minister also had no answer as to the possible effects of police enforcement on countering tuning up (light) mopeds: ' to be able to make statements about the effectiveness of the measures, it is important to know how many people have been checked and/or how many hours of enforcement was conducted on the various measures. This data is lacking.’ . What has been the effect of the moped riding licence? In 2006, the moped certificate was replaced by a moped riding licence for mopeds and light mopeds. Initially, the exam had only a theoretical part, but starting from March 1, 2010 a practical test was added. In addition to training and examination, the introduction of a riding licence has the advantage of making it easier to punish and that, as for drivers, a demerit points system could be introduced for novice (light-)moped riders (CBR). No clear effect of the introduction of the moped riding test on the risk of (light-)moped riders could be established. However, moped possession among youths, and with it the number of crashes, greatly diminished following the introduction of the measure . The number of 15-to 17-year-old (light-)moped casualties was found to have declined relatively quickly after the introduction, but the decline was not statistically significant. This decline was a direct result of the decrease in the number of young (light-)moped riders. This was caused by the threshold effect of the practical test and the simultaneous introduction of the measure 2toDrive, which allows 16-17 year-olds to start driving lessons. It could therefore not be shown that the moped practical test had a positive effect on crash risk of (light-)moped riders. Which additional safety measures may be taken? Below a number of measures will be discussed that can improve the safety of (light) mopeds. Like cyclists, (light-)moped riders are hindered by obstacles on or along the cycle path and by cycle paths that are narrower than prescribed in the guidelines  .Safety on cycle paths can be improved by removing obstacles on and along the bike path and by designing cycle paths according to the guidelines (e.g. width and curve radius). More measures to improve the safety of (light-)moped riders on the cycle path, can be found in Davidse et al. (2017) . Measurements show that nearly all (also not tuned up) mopeds exceed the maximum allowed speed of 25 km/h (see also the question How fast do light-moped riders travel?). Especially on the cycle path this leads to (subjective) unsafety and perceived inconvenience. Analyses of light-moped crashes show that a speed that is too high (for the conditions) is an important crash factor   (see also the question What are the causes of crashes involving (light-)mopeds?). In addition to checking (light) mopeds on construction speed (via the dynamometer test), (more) enforcement of the maximum riding speed could be carried (for example with a laser gun). This has been possible since 2015 after amendments to the legislation . This allows for the use of smaller error margins and more effective enforcement. Enforcement through a laser gun is less labour intensive, can be done at more locations, and can change locations more rapidly hence making it less easy to dodge control. The effectiveness of enforcement is subject to sufficient enforcement effort (see also SWOV Fact sheet Police traffic enforcement). Although injury crashes due to collisions between light-moped riders and cyclists on the cycle path are not frequent  ,the light moped on the bike path is seen as a source of (subjective) unsafety and inconvenience. To make it possible for municipalities to move the light moped to the roadway – with mandatory helmet use –in certain locations, the Minister has sent a draft decision to Dutch Parliament . An assessment of the road safety effects of moving the light moped - with mandatory helmet use- to the roadway that was made for the city of Amsterdam (measure Light moped on the roadway; SOR) found an annual reduction of 261 casualties (-38%) . The largest estimated safety gains are achieved by an expected ‘modal shift’, that is to say: after the measure is introduced light-moped riders choose another, safer mode of transport. Due to the large uncertainties in estimating the effect, in the absence of factual information on safety effects, it is recommended not to introduce the measure SOR without mandatory helmet use, to evaluate the measure carefully with explicit attention to the speed difference between light-moped s and cars on the roadway. Davidse et al. comment that the speed differences between cars and light mopeds on 50km/h roads will be considerable as the legal maximum speed for light mopeds is 25 km/h. It is remarkable that light-moped riders in the Netherlands do not have to wear a helmet. In the few countries that know a moped (according to Davidse et al. light mopeds can only be found on the roads in the Netherlands, Belgium, Germany, Denmark, Sweden and Switzerland) it is mandatory to wear a helmet. The Netherlands is the only country in Europe where a light-moped rider can ride without a helmet (see Figure 5), whereas the protective effects of a helmet are large  (see also the question What is the effect of the moped helmet?). However, it is not clear what the effect of mandatory helmet use for light-moped riders would be on road safety in its entirety. It could be the case that light-moped riders, if they do have to wear a helmet, change to the moped, or in fact, licence their light moped as a moped at the Netherlands Vehicle Authority RDW (the AM licence is also valid for this category). It's uncertain what the ultimate effect on road safety will be, as we don't know the individual risk of riding a moped as opposed to riding a light moped (see also the question How high are the risks for (light-)moped riders in Dutch traffic?). Below you will find the list of references that are used in this fact sheet. On our library portal you can find more literature on this topic.
. WVW (1994). Wegenverkeerswet 1994. Geraadpleegd 26-06-2017 op http://wetten.overheid.nl/BWBR0006622/2012-10-01.
. SWOV (2016). Gegevensbronnen. Uitgebreid overzicht. SWOV, Den Haag.
. Davidse, R.J., Van Duijvenvoorde, K., Boele, M.J., Louwerse, W.J.R., et al. (2017). Snorfietsongevallen op het fietspad. Hoe ontstaan ze en hoe zijn ze te voorkomen? R-2017-12. SWOV, Den Haag.
. Møller, M. & Haustein, S. (2016). Factors contributing to young moped rider accidents in Denmark. In: Accident Analysis & Prevention, vol. 87, p. 1-7.
. Goldenbeld, C. & Houwing, S. (2001). De rijvaardigheid en trainbaarheid van jonge verkeersdeelnemers. Een wetenschappelijk experiment met jonge bromfietsers in het verkeer van Leeuwarden en omgeving. R-2001-16. SWOV, Leidschendam.
. Algera, J. (2015). Ongevallen met opgevoerde snorfietsen. Scriptie HAN Automotive. SWOV, Den Haag.
. De Groot-Mesken, J., Vissers, L. & Duivenvoorden, C.W.A.E. (2015). Gebruikers van het fietspad in de stad. Aantallen, kenmerken, gedrag en conflicten. R-2015-21. SWOV, Den Haag.
. Wijlhuizen, G.J., Dijkstra, A., Bos, N.M., Goldenbeld, C., et al. (2013). Educated Guess van gevolgen voor verkeersslachtoffers door maatregel Snorfiets op de rijbaan (SOR) in Amsterdam: een eerste inschatting van effecten gerelateerd aan verkeersveiligheid. D-2013-11. SWOV, Den Haag.
. De Lange, M., Muller, S. & Faber, G. (2011). Blauwe brommers op fietspaden: rapportage van een onderzoek naar de hinder en het gevaar van snorfietsen op fietspaden. Fietsersbond, Amsterdam.
. Methorst, R., Schepers, J.P. & Vermeulen, W. (2011). Snorfiets op het fietspad. Directoraat-Generaal Rijkswaterstaat, Dienst Verkeer en Scheepvaart DVS, Delft.
. Dufec (2015). Monitoring Snelheid Scooters Amsterdam. Dufec, Tilburg.
. Liu, B.C., Ivers, R., Norton, R., Boufous, S., et al. (2008). Helmets for preventing injury in motorcycle riders. In: Cochrane Database of Systematic Reviews 2008.
. AVV (2001). Evaluatie verkeersveiligheidseffecten 'Bromfiets op de rijbaan'. Directoraat-Generaal Rijkswaterstaat, Adviesdienst Verkeer en Vervoer, Rotterdam.
. BOVAG-RAI (2004). Akkoord zelfregulering bromfietsen inclusief Reclamecode. Stichting BOVAG-RAI, Amsterdam.
. RAI Vereniging (2008). RAI Vereniging en BOVAG zeggen overtreders 'Bromfietsconvenant' de wacht aan. In: RAI Voorrang, vol. 13, nr. 16, p. 2.
. Goldenbeld, C., De Groot-Mesken, J. & Van der Zwan, S. (2014). Inventarisatie van handhavings- en educatieprojecten gericht op de bromfiets. R-2014-4. SWOV, Den Haag.
. Ministerie van IenM (2016). Beantwoording motie Hoogland plan van aanpak snorfietsoverlast en motie De Rouwe evaluatie maatregelen snorfietsoverlast. Brief 31 oktober 2016 aan de voorzitter van de Tweede Kamer der Staten-Generaal. Ministerie van Infrastructuur en Milieu, Den Haag.
. Goldenbeld, C., Wijlhuizen, G.J., Vlakveld, W.P., Commandeur, J.J.F., et al. (2013). Evaluatie van het bromfietspraktijkexamen: onderzoek naar de werking van het bromfietspraktijkexamen en voorbereidende theorielessen op de verkeersveiligheid. R-2013-6. SWOV, Leidschendam.
. Davidse, R.J., Van Duijvenvoorde, K., Boele, M.J., Doumen, M.J.A., et al. (2014). Letselongevallen van fietsende 50-plussers; Hoe ontstaan ze en wat kunnen we eraan doen? R-2014-3. SWOV, Den Haag.
. Ministerie van IenM (2017). Aanbieding ontwerpbesluit tot wijziging BABW en RVV ter invoering van de mogelijkheid snorfietsers in gevallen te verplichten rijbaan gebruiken. Brief 10 juli 2017 aan de voorzitter van de Tweede Kamer der Staten-Generaal. Nummer 29398-566. Ministerie van Infrastructuur en Milieu, Den Haag.
. Leijdesdorff, H.A., Siegerink, B., Sier, C.F.M., Reurings, M.C.B., et al. (2012). Ongelukken met gemotoriseerde tweewielers; Letselpatroon, letselernst en mortaliteit. In: Nederlands Tijdschrift voor Geneeskunde, vol. 156, nr. A5165.
. WHO (2013). 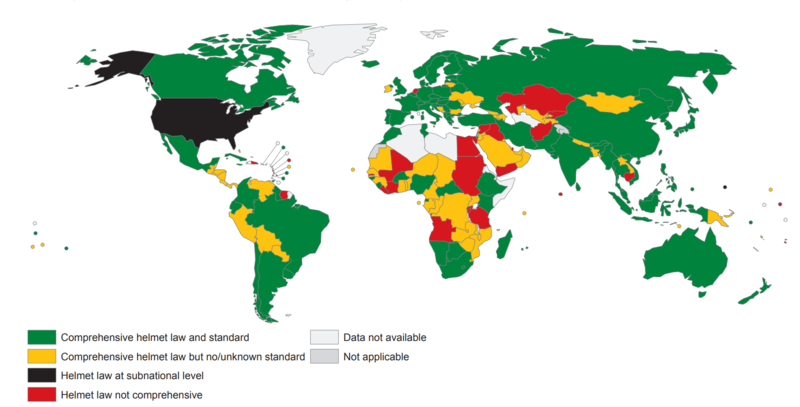 Global status report on road safety 2013: supporting a decade of action. WHO. SWOV (2017). Moped and light-moped riders. SWOV Fact sheet, October 2017. SWOV, The Hague.